How have you all been enjoying this series? I hope it's brought some encouragement and insight into the importance of love. Since February is such a short month we are wrapping up this series. 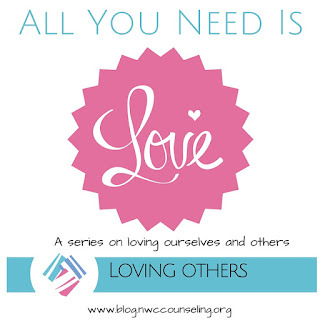 But we couldn't end it without talking about the healthy connection between loving ourselves and loving others. What did you think of last week's post? Were you loving yourself or neglecting? Either way, were you able to make any small changes to begin a more positive track? These questions are vital because today we are moving on to loving others. I took a blogging break in January to really focus on my blog outline for 2016, the topics, issues, and challenges I wanted to give encouragement on. Naturally for February, I wanted to really hone in on the notion of Love. Through marriage, through relationships, and most importantly loving ourselves. Hence - my February series: All you need is love! Today's post is targeted specifically about loving yourself. I'm sure you've heard it before - but how can you love someone else, when you don't love yourself? What does that even mean, though?